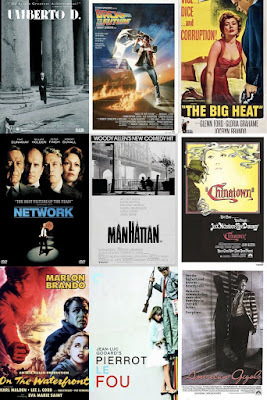 Christina Newland: Writing on film & Culture: My Personal Top Ten Movies...the first five. Since some friends and I were passionately and drunkenly arguing this over cocktails the other weekend, I put some (okay, a lot) of thought into what my all-time (and by all time I mean, at the moment, mostly) favourite films are. The only rule we made was that you can't list the same director twice, which makes life considerably difficult when you've spent a year of your life writing a 13,000 word dissertation yawping on about how great Martin Scorsese is. Too many film people write lists, mainly because its fun, but it's something I should probably avoid doing in the future because its always struck me as amateurish. I enjoy it, thought, so...here goes. In no particular order. Polanski's chilling noir mystery is as black as night, more than a little bizarre, and at times, downright nasty. The twist at the end is jaw-dropping, and the conclusion to the film itself just renders me speechless with horror. The plot is writhing with complexity, but suffice it to say that it does interesting things with the film noir genre. In many ways, it could be called conventional, but it goes those few steps further, and does everything that film noir should have logically extended itself toward. There's social critique, seediness which actually depicts something genuinely seedy, unpleasant and unsightly wounds gained by the private eye from frequenting unsavoury places - all the things classical Hollywood may not have been so keen on including. The aforementioned wound is one Jack Nicholson walks around with for a good three-quarters of the film, with a big bandage across his nose; it's a bizarre thing to do to the face of your main character, the guy we've all got to look at for the rest of the movie. Nicholson, unsurprisingly, pulls it off, because frankly I'm convinced there's very little he couldn't. There's a crude joke in there somewhere; an expression of the price you pay for, quite literally, sticking your nose too far into the lives of the rich and powerful. He's doing some of his very best work in this movie; subtle, suggestive in his physical and facial tics rather than his speech. Faye Dunaway is always wonderfully neurotic but I think John Huston steals the show; his friendly Southern gentleman's demeanour hides a twisted, corrupted soul, his malevolence is just under the surface. The ending is gruesome in a whole host of different ways, but I daren't say more. Chinatown seems to provide a metaphor for the monstrous secrecy of the corrupt ruling classes, or maybe more generally the hopelessness of existence. Thus,'Forget it Jake, it's Chinatown', is not a flippant remark to reassure the traumatised detective, but an expression of a senseless world which laughs in the face of all those who try, like Jake does, to do the right thing and make sense of it all. To me, this is Schrader's best directorial work. It's the seedy but redemptive tale of a high-class gigolo who pleasures wealthy older women, gets tangled in an ugly situation, and ends up being framed for a brutal murder. From the neon-lit underbelly of LA to the glamorous hotels and art auctions where Julian Kay (Gere) operates, Schrader fills his shots with a photographic sensibility, layering his locations with detail. Gere has never been a master actor but he has charisma in spades, and as Julian, he is tanned, sensual, and sleazy. He is infinitely watchable as the materialistic, self-serving being he inhabits - he really is a movie star in the proper sense. Lauren Hutton has a tenderness behind her aloof blondness. The film is, of course, inimitably stylish, from the Blondie soundtrack to the Armani suits and sleek Mercedes SL Gere drives (and later destroys in quite a memorable fashion) - it really does preempt 1980's consumerism and its obsession with luxury items. The ending, with its obvious references to Bresson's Pickpocket, has an almost mystical ability to reduce me to tears. It is to do with love as a means of redemption; redemption not from moral failings, necessarily, but from the kind of spiritual emptiness that precedes it. In spite of the characters' complete lack of moral fiber, in spite of the un-sentimentality of the film in general - maybe even more so because of this - it is a beautiful moment of grace and redemption in a film that, despite its stylish flourishes, is about a very ugly world indeed. I have spent so long writing about Raging Bull, particularly in an academic context, that it seems strange to write about it in an off-the-cuff 'I like this movie' sort of way. Nonetheless, like is something of an understatement. This movie is about as close to perfect as I can imagine any movie being. From the opening shots of De Niro shadowboxing in the ring alongside Mascagni's elegiac score to the final shots of bloated old De Niro reciting the 'I coulda been a contender' speech in a monotone, it sends shivers up my spine. There's a dutiful pity we feel toward such a pathetically self-deluded character, but it also ponders something more mysterious about the human condition, and about what it means to be a man. The film is full of inarticulate rage and violence, with dialogue as rough and uncouth as imaginable - but is so tenderly and poetically filmed, from the bizarre point of view shots, zooms, and jarring cuts, to the crisp black and white it was shot in. The boxing scenes are brutal and beautiful all at once, and La Motta is so unpleasant it always strikes me that Raging Bull is a bit like writing a Shakespearean sonnet about a rock. There is something bafflingly appealing about that in itself; about taking the vulgar and ugly and creating something of lasting merit out of it, but the movie also speaks about Scorsese's inability to shy away from the dark corners of American society, and in La Motta's case, the even-darker corners of the American soul. Choosing between Godard films is practically impossible; Vivre sa vie is a close second choice, as a more linear narrative style works in Godard's favor, as opposed to the later, more radically styled films. But for me, I still prefer the barely-contained cinematic anarchy that Pierrot le Fou exemplifies. It is visually unmatched; fresh-faced, rebellious, intellectual, decidedly fashionable - a homage to pop culture, literature, classic Hollywood girl & gun films. It is stylish, romantic, occasionally political (the amusing sequence where Karina and Belmondo do a two-man pantomime of the Vietnam War comes to mind), though it is just as often a mildly surrealist dalliance of youthful adventure & defiance. I couldn't reasonably explain the plot - only that it's a sort-of road movie, occasionally and arbitrarily breaks into song, and constantly makes cultural references by either quoting them or flashing them across the screen in bursts of primary colour. Speaking of primary colour, (I'd ruin it if I explained...) Belmondo in the finale is so wonderfully absurdist and thought-provoking I wouldn't hesitate to compare the ending to the final act of a Samuel Beckett play. Karina and Belmondo, by the way, are one of the most beautiful and eccentric movie pairings in cinema; Belmondo's broody charm and crooked boxer's nose and Karina's flighty, ephemeral beauty and childlike playfulness make them incredibly watchable. Watching Pierrot le Fou is a bit like watching a movie-length pop culture artefact, condensing a century's worth of arts into a playful collection of moving images. I'm not sure that there's much to say that hasn't been said about On the Waterfront. I have something of a weakness for Elia Kazan - he is so overlooked to say he helped start the Actor's Studio and made A Streetcar Named Desire and East of Eden. Of course, his brush with Senator McCarthy and his decision to name names has a lot to do with it. He is widely regarded as a traitor in Hollywood - apparently, in 1999 when Kazan received an honorary Academy Award, much of the audience remained seated in protest. Regardless, he deserves his due - it is hard to imagine the influence Kazan has had on movies, and On the Waterfront is a stirring example. Brando changed the face of modern acting as Terry Malloy, the big lump of a dockside worker with a gangster for a brother and more of a conscience then said brother would prefer. He is likeable in a sort of wilfully dumb, lumbering, cocky way, his broad shoulders tense and his speech declarative and short. Eva Marie Saint is so completely his foil; small, graceful, blonde, almost bird-like. The texture of reality in a film of this period is impressive, and as one of the rare Hollywood films shot on-location during a bitterly cold New York winter, each time an actor expels a visible breath into the freezing air we can practically feel it. While On the Waterfront is postured as a social problem film like those of 30's Hollywood, it really seems to be about something else altogether; Kazan and screenwriter Budd Schulberg's guilty history with the House Un-American Activities Committee. The ending of On the Waterfront is stirring, and celebrates Brando's individual triumph, but also seems to celebrate the will of the workers. I've always found the politics of this to be murky, but for once, I end up separating it from political ideology completely. What I'm about to say is undoubtebly problematic academically speaking, but I tend to take the movie at face value. It is the story of an individual man's triumph against the overwhelming forces pulling against him; he becomes heroic by standing up, strong enough to do the right thing even at great personal risk. Terry Malloy is no longer 'a bum' when he leads the dockworkers back to their work, bruised and beaten; he is a somebody. That might sound like mythic American claptrap, but to me, it sounds more like redemption.